Hello again, hello again! We hope you have had a nice couple of weeks and had a chance to catch up on the odds and ends of produce that were hanging around your fridge. Without harvest and delivery last week, Heather and I were able to focus our energy on cleaning up the farm in preparation for next spring. All of the 300 some pieces of rebar used to trellis the tomatoes have been pulled, drip line has been wound up, sandbags and row cover taken out of the fields, and the new greenhouse is slowly coming together. We’ve also been taking some time to catch up on sleep and eating a lot of delicious fall food. It is exciting to be doing an extended share this year, bringing you some familiar favorites as well as a few new items. 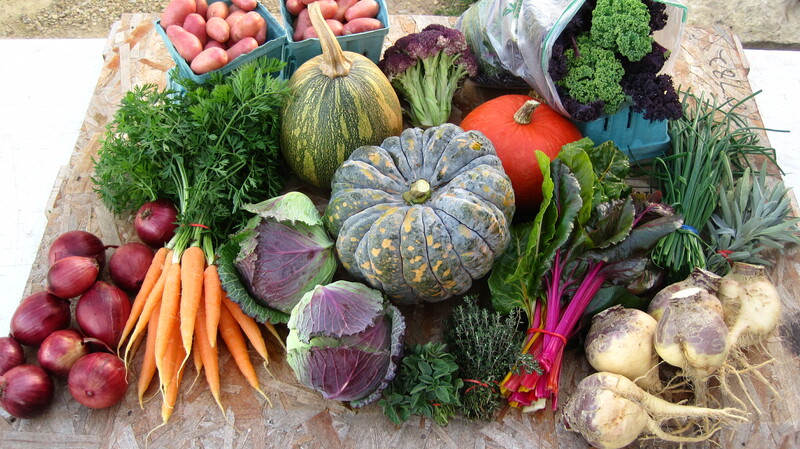 For past generations, the need to have produce keep all winter has led to the development of fall crops that are dense, hearty and keep well–until new crops can be grown once again. It is a very tangible example of climate shaping our culture of food. The double size of the shares may seem daunting at first, but most fall crops will keep very well and last through a good part of the winter if kept properly. There are some storage tips listed close to the end of the newsletter to help keep your produce in its best shape all winter long. Every year we try a few new varieties of winter squash, melons and tomatoes. This year we had seven new trial winter squash/pumpkins, some of the favorites will be showing up in your winter shares and will become part of our regular repertoire next year including two featured in this delivery: Chirimen and Fairy. Chirimen is a Japanese variety that is quite delicious and sweet. Don’t let its unusual and humble exterior fool you, this is one excellent squash. Its texture is like a cross between the acorn types (delicata, carnival, jester, etc.) and the maxima types (kabocha, kuri, buttercup) and is good for any use whether roasted and pureed or cubed and sautéed. We were very pleased with how tasty this squash was and how visually interesting its exterior is. 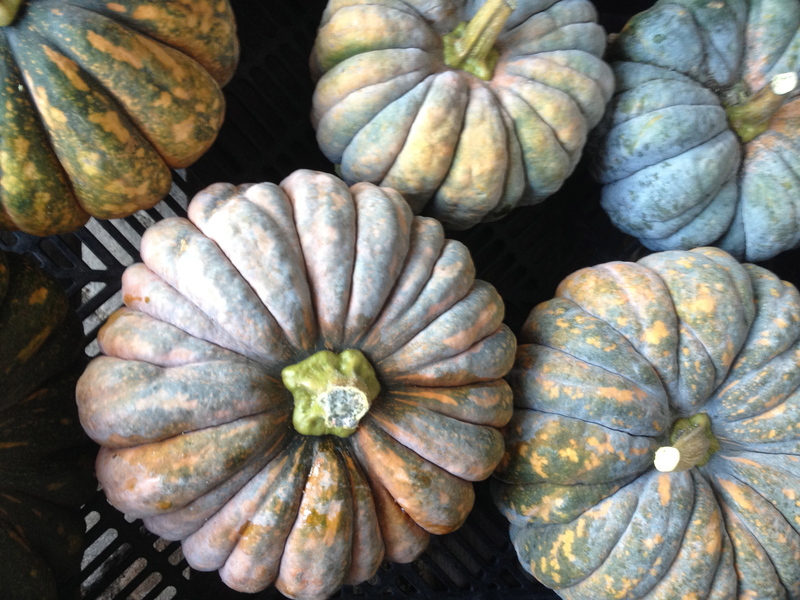 I really like the color of this squash and how its skin has a natural “chalky” appearance and texture. Fairy is another neat looking squash, but in a much more adorable way. Very smooth skin with a pretty green and yellow mottling, this squash is in the Pepo family and is very much like what we think of as a cooking pumpkin. It has a rich dark orange flesh that has a strong savory quality to it and is appropriate for any use, including pies (there will also be a traditional pie pumpkin coming next delivery, just so you know). Potatoes and Squash: Potatoes are different than the other root crops (technically they are not really a root either, they are a tuber). 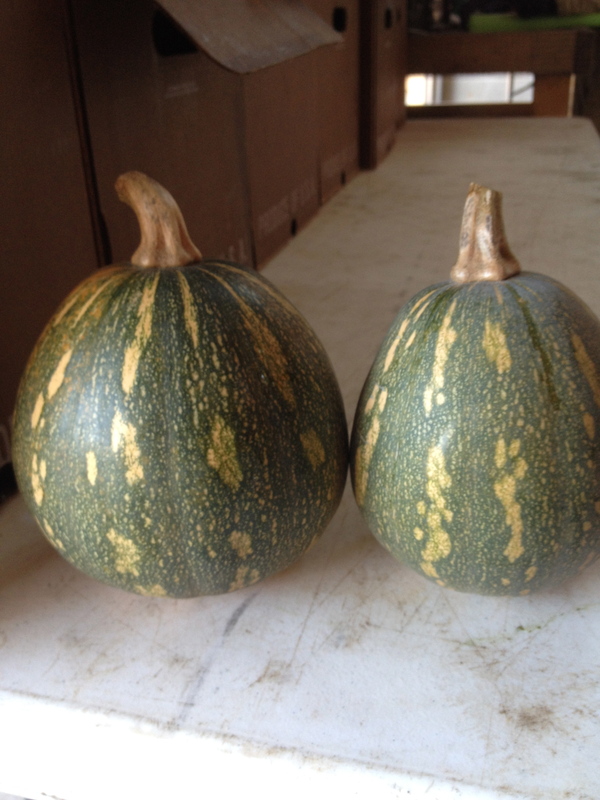 They, as well as winter squash, want to be in a dry cool place–but not too cold! Potatoes ideal temperature is between 45-50 degrees and able to breathe. Much colder than this and the texture of the potato will be compromised. Remove your potatoes from the plastic bag they came in and put them in a dry bag with holes or a paper bag. If potatoes or squash are in a damp or humid environment they will quickly rot. We usually keep our potatoes in a basket in our pantry and leave our squash on display on our counter tops, never putting either in the fridge unless they’ve been cut open. If you have a room in your house that is kept cooler during the winter but doesn’t freeze, this would also be an ideal place. Cabbage and Cauliflower: Both like similar conditions to root vegetables, cold and humid. Use the plastic bag your potatoes came in or any other produce bag you have around to wrap up your cauliflower and cabbage and put i the crisper in your fridge. The same principles of respiration apply: if they are not wrapped up they will soon become soft and spongy. Your cabbage should keep at least until January (if not longer) if kept properly. If you are delaying your cabbage gratification until early spring, check on it every now and then to cut off any damage or spoiling parts. Herbs: Herbs like chives that have a high water content should be kept like greens: in a bag in the crisper. Herbs like thyme and sage can be kept in the fridge or on the counter. Both time and sage will have a tendency to dry well if they are kept on the counter or hung and can then be used later in the year. After they are fully dry you can put them in a bag or bottle, or simply leave them out and use when needed. Oregano, if wanted to be used fresh, should be kept in a bag in the fridge. Its leaves are more prone to wilting while drying, making it not as usable in the stages between fresh and dried. You can hang your bundle if you wish to dry it, or spread the individual stems out on the counter or on a ventilated surface (screen or cookie cooling rack). Once dry, crumble the dried leaves into a container and discard the stems. Heat half the oil over medium heat, then reduce to medium-low. Add the onions and season with salt. Cook for about 10 minutes, or until soft, adding a bit of water if necessary to prevent sticking. Add the garlic and cook for about 5 more minutes. Sprinkle the shallots around a 9-inch oval baking dish. Preheat oven to 350 degrees Fahrenheit. Combine breadcrumbs, cheese and sage, and set aside. Peel, then slice the squash into 1/4-inch-thick cubes or slices. Toss squash pieces in remaining oil, then layer them over the shallots. Season with salt and a light dusting of freshly grated nutmeg. Sprinkle the breadcrumb mixture over the top. Cover and bake for 1 hour, or until the squash is fully tender. Let the pan rest about 10 minutes, then broil it uncovered to brown the top. (If you can’t resist, you can sprinkle on more cheese.) Serves 4 to 6.